Prime Digital Academy is a private career school located in Minneapolis, Minnesota focused on educating students in the realms of full stack software development and user experience design through an immersive, bootcamp-style program. Work with a team to create a design strategy for Prime Digital Academy focused on finding ways to help prospective students better perceive the expectations of Prime in order to self-assess whether or not these expectations align with their own understanding of what the experience will really be like for them. Administrative staff who are responsible for the day to day workings of Prime Digital Academy as well as prospective students who are examining and evaluating Prime as an option. The project started with an exploratory conversation with Prime administrative staff. This conversation was important in order to gain an in-depth understanding of how staff view current admissions procedures. 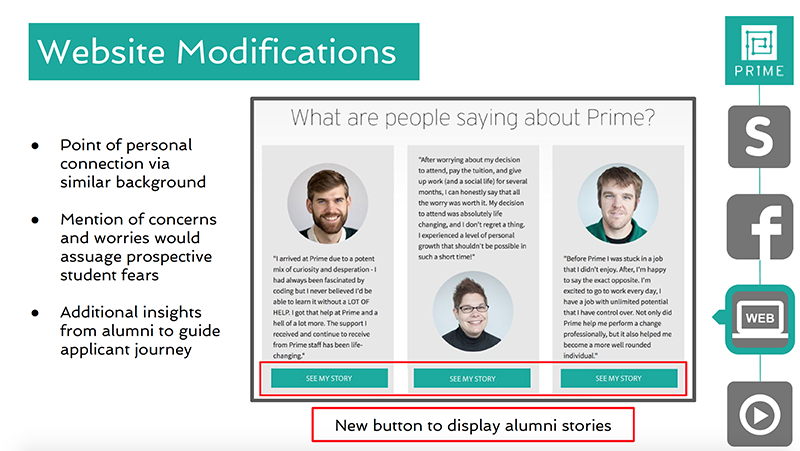 It was also necessary to ask questions about how staff members feel that prospective students are impacted by Prime’s existing processes and website content. The first step in the process toward the development of a design strategy for Prime Digital Academy involved research. The team explored a variety of areas relating to the client’s problem space including the content of the Prime website and their social media accounts, data and statistics related to current and prospective Prime students, related bootcamp competitor programs, and topics such as student self assessment in education, why students select particular institutions, and self assessment for programming and user experience fields. This research step was important in order to gather as much information about not only Prime itself but also to develop an understanding about all of the factors involved in making decisions related to whether or not Prime would be a good fit for a particular individual. The group next brainstormed and developed ideas and possible design strategy solutions surrounding the theme of community at Prime. The concept of community at Prime is extremely important. Based on our competitor research, we felt that this sense of community is sometimes missing from other similar programs. Emphasizing this aspect would highlight one of Prime’s strongest qualities to prospective students. 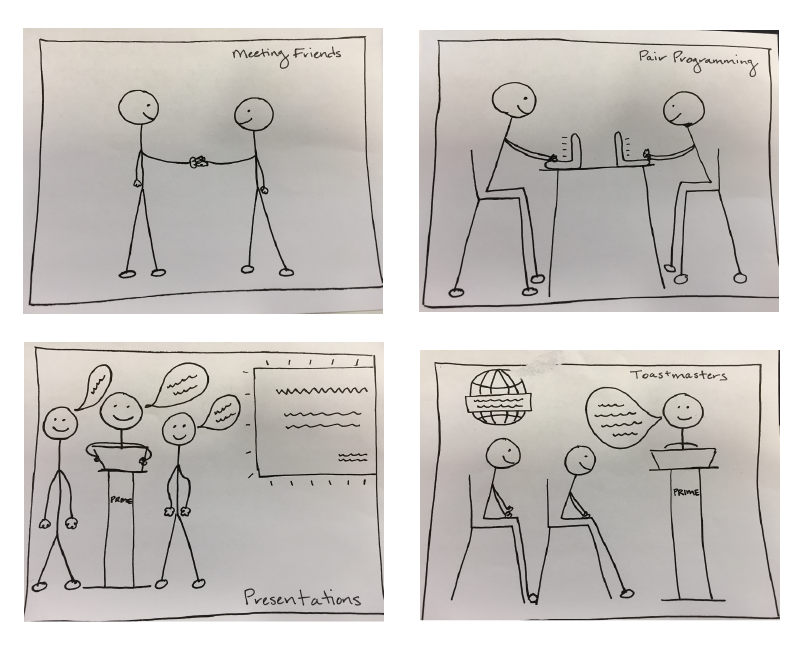 Sketched prototypes were developed to show moments and examples of community with relation to Prime. 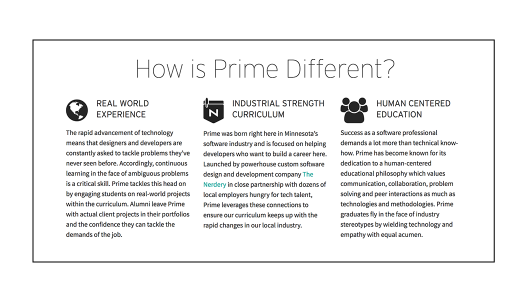 We also believed that honesty about the challenges in Prime’s program should be an important piece of the design strategy. The team next developed short term and long term project ideas relating to both of the themes of community and honesty. 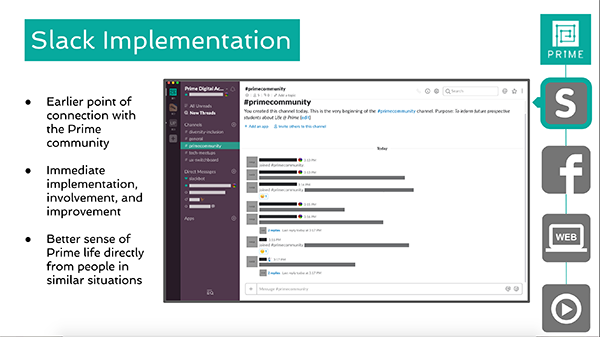 One of the short term strategies included integrating a prospective student channel into the existing Slack community at Prime. Current students and alums could answer questions proposed by prospective students, alleviating some of the communication Prime staff handle on a daily basis. This direct connection to existing students and alums would connect prospective students to the community immediately and hopefully help these individuals make their decision about attending Prime. Social media was also a focus in the design strategy. The main idea here was to have all Prime staff create one social media post a week that would then be released across multiple channels like Facebook, Twitter, and Instagram. For example, the post might show instructors teaching their classes, students working on projects, events and speakers, etc. with the intent to open up the Prime community to the greater world. One post a week would be manageable for staff and would also have the potential to increase overall awareness of what Prime Digital Academy is like. One additional short term strategy was to make small changes and additions to the existing Prime website to include more personal information about the backgrounds and characteristics of Prime students. We believed that including more information about where students are coming from would help prospective students better identify with the community and therefore make it easier for them to determine if they fit in at Prime. Long term design strategies were focused on the idea of creating additional videos about the Prime community. There are a handful of videos that already exist that relate to Prime and the community but these videos are often difficult to find and are fairly short. 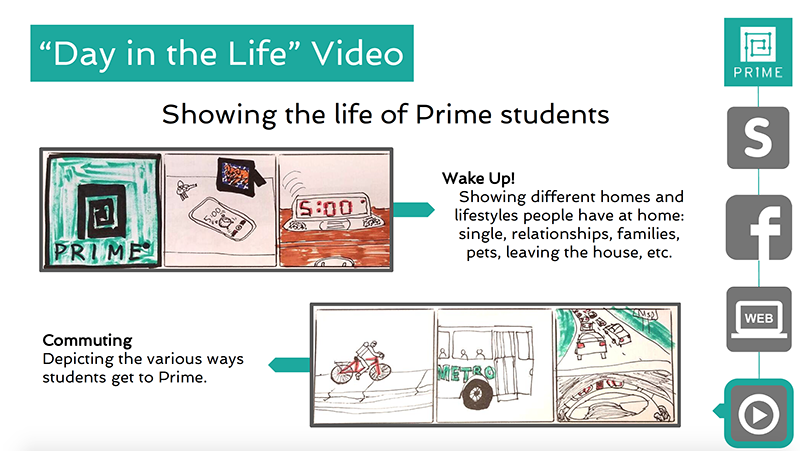 Our main long term strategy was to have Prime develop an approximately 10 minute “day in the life” kind of video highlighting around 2-4 current Prime students. The video would show these students throughout a day, emphasizing what life is like when you are working through the bootcamp program. We felt this approach was very important because it would give an honest view of the work involved in being a Prime community member. Additional shorter videos could also be created to highlight individual aspects of the Prime community. For example, videos on the support available from staff at Prime, events, speakers, the weekly Toastmasters meeting, etc. would be concise topics and allow for a glimpse of the various pieces involved in bringing the Prime community together. A timeline was developed showing the path a prospective student might follow on their journey toward Prime. This timeline highlights when the short term and long term strategies of the design strategy might impact prospective students along the path. For this project, it was important that all aspects of the design strategy focus on the Prime community while also emphasizing an honest portrayal of this community at the same time. 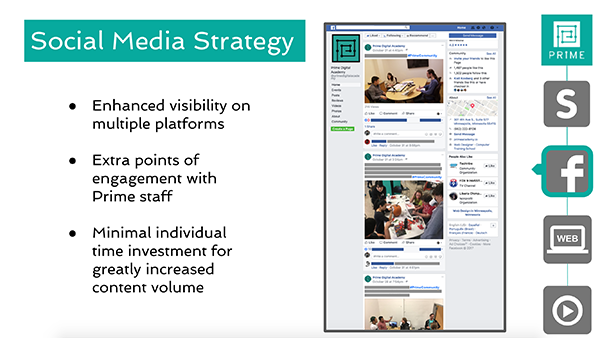 The four main strategies proposed include Slack integration for prospective students, a social media campaign approach for staff, website updates and additions, and both shorter and longer videos all emphasizing student backgrounds and characteristics of the Prime community. We believed this approach would still encourage students to consider coming to Prime but at the same time, help them better self assess whether the Prime community and program would be a match for them.